Actress Janhvi Kapoor, who has been promoting her recent release 'Dhadak' alongside Ishaan Khattar extensively was on Wednesday snapped outside the residence of her half-brother Arjun Kapoor. 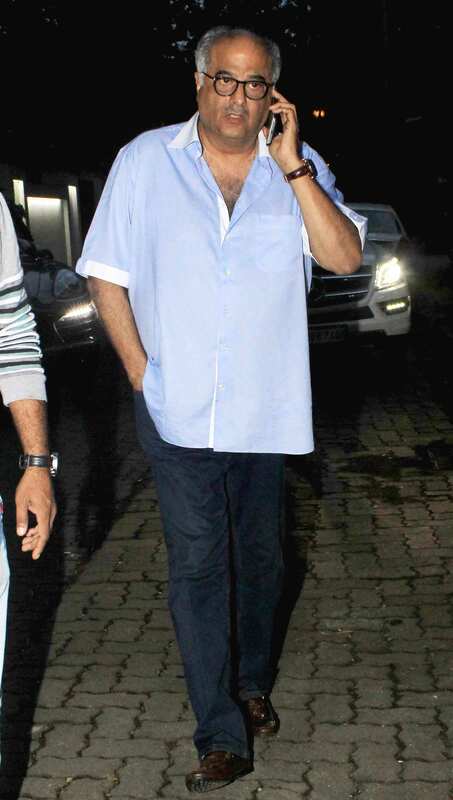 Janhvi was accompanied with her father Boney Kapoor. The father-daughter duo looked in a jovial mood as they were clicked outside Arjun's residence. After the sudden demise of her mother Sridevi, Janhvi got very close to her half-sibling Arjun and Anshula Kapoor. While Arjun has been keeping busy with his films - 'Namastey London' and 'Sandeep Aur Pinky Faraar', Janhvi is often seen hanging out with Anshula and her younger sister Khushi. Janhvi recently extended her heartfelt thanks and gratitude to the team of Dhadak for their positive and overwhelming response while also sharing some fun behind-the-scenes photos of the team from the sets. The girl posted on Instagram writing, "She wrote," Thankful, grateful, and blessed, for all of you, and because of all of you. #dhadak." Talking about her film, Janhvi said she does not feel she has become a star with the success of the film but she is just trying to be an actor. There was a lot of buzz about her debut in Dharma Productions 'Dhadak' even before its release and now that the film is getting a positive response from the audience, it is said that Janhvi Kapoor is on her way to become successful. Earlier, talking about her daughter's foray into Bollywood, Boney Kapoor said, "I'm excited about it. May God bless her and may the blessings of her mother help her carry forward the legacy that she has created. And I'm sure, Janhvi, with the kind of dedication and hard work that she has put in this film and the kind of approach she has, will in her own individual way carry on to enlarge the legacy."